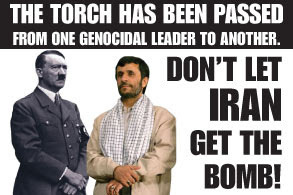 ‘Ahmadinejad Hitler Comparison’ – Islamic Hitler | Free Israel! The ‘Ahmadinejad Hitler’ comparison has run from Germany’s A. Merkel, to Italy’s pres. to US officials, and beyond. When searching http://www.google.com/search?q=ahmadinejad+hitler, you get: About 1,060,000 results on Google. John Hagee calls Ahmadinejad the ‘Hitler of the Middle East’ Mar 9, 2010 … Pastor reaffirms unwavering support for the Jewish state and Jewish people during his group’s annual Night to Honor Israel in J’lem. Italian Prime Minister Silvio Berlusconi drew a connecting line yesterday between his visit to the Yad Vashem Holocaust Museum in Jerusalem, the Iranian nuclear program, and Iranian President Mahmoud Ahmadinejad’s denial of the Holocaust and calls for Israel’s destruction. Italy's Prime Minister Silvio Berlusconi implicitely compared Irans President Mahmoud Ahmadinejad to Adolf Hitler at an award ceremony in Paris. 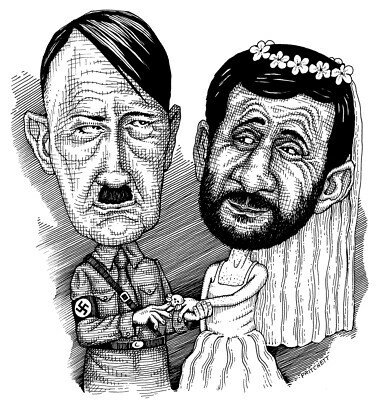 …Even German Chancellor Angela Merkel has compared Ahmadinejad to the Nazis. 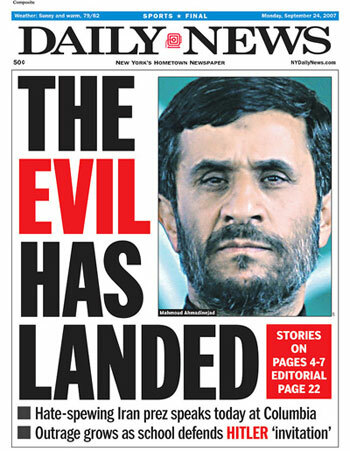 President Ahmadinejad was described as a new Hitler threatening to unleash catastrophe upon the world. Iran Hitler Ahmadinejad At Columbia Free Speech Or Incitement? Sep 24, 2007 Ya see, I live and work in Israel, a tiny, democratic nation in the Middle East which Ahmadinejad has sworn to "wipe my children off the map." Not really a nice thing of this dictator who fashions himself after Adolf Hitler with a twist of Islamic lemon to say. Ahmadinejad's Iran is one of the world's leading sponsors of international terror, especially the Hizbullah gang in Lebanon, and he is now obsessed with building thermonuclear weapons with which he might just accomplish what Hitler could not: the annihilation of half the world's Jews with the push of a single button. Ahmadinejad is also directly responsible for the murder of dozens of numbers of American troops in Iraq, whose killers, according to hundreds of reliable reports, he is arming and funding. The US State Department calls Iran a state sponsor of terror, and Ahmadinejad has called the Holocaust “a myth'' and urges for Israel to be destroyed. …But in a cruel historical irony, doing so required concentration — putting all the eggs back in one basket, a tiny territory hard by the Mediterranean, eight miles wide at its waist. A tempting target for those who would finish Hitler's work. As it races to acquire nuclear weapons, Iran makes clear that if there is any trouble, the Jews will be the first to suffer. "We have announced that wherever [in Iran] America does make any mischief, the first place we target will be Israel," said Gen. Mohammad Ebrahim Dehghani, a top Revolutionary Guards commander. Hitler was only slightly more direct when he announced seven months before invading Poland that, if there was another war, "the result will be . . . the annihilation of the Jewish race in Europe." …Bernard Lewis, America's dean of Islamic studies, who just turned 90 and remembers the 20th century well, confessed that for the first time he feels it is 1938 again. He did not need to add that in 1938, in the face of the gathering storm — a fanatical, aggressive, openly declared enemy of the West, and most determinedly of the Jews — the world did nothing. When Iran's mullahs acquire their coveted nukes in the next few years, the number of Jews in Israel will just be reaching 6 million. Never again? Iran: President Mahmoud Ahmadinejad has much in common with Adolf Hitler — hatred of Jews, warmongering, delusions of divine inspiration. Now add this: His own people have tried to blow him to smithereens. After surviving the July 20, 1944, plot on his life at his field headquarters near Rastenburg (now Ketrzyn) in Poland, Hitler said: “I take this as confirmation of my assignment from Providence to continue to pursue my life’s goal as I have done hitherto.” Historians believe that afterwards nearly 5,000 people were executed by the Gestapo. When the news spread of Mahmoud Ahmadinejad surviving a homemade bomb being tossed at his convoy in Hamedan in western Iran Wednesday, some Iranian opposition groups were acting as if Tehran’s 21st century Gestapo, the Revolutionary Guards, might similarly come after them. And, like Hitler, Ahmadinejad and Iran’s Supreme Leader, the Ayatollah Khamenei, have put their jackboots where their mouths are, successfully putting down the popular demonstrations last summer after Ahmadinejad’s fraudulent re-election. Of course, there were many attempts on Hitler’s life, the most interesting being Georg Elser’s planting of a homemade bomb at the Burgerbraukeller in Munich in late 1939, which detonated right on schedule but failed because Hitler chose not to be as long-winded as usual . A carpenter of modest education, Elser was motivated by the deep resentment he felt over Nazi restrictions on German workers’ freedom to organize themselves. Much the same kind of resentment has been on the rise among ordinary Iranians. This entry was posted on December 3, 2010 at 4:56 am and is filed under Uncategorized. You can follow any responses to this entry through the RSS 2.0 feed. You can leave a response, or trackback from your own site.